How do I check my Speedify data usage? If you are using a a Free Speedify Plan, you are limited to 5 GB of Speedify data per month. You can see your Speedify Data usage from the main Dashboard: there is a usage meter in the Account section that shows you how much has been used and how much is still available. If you'd like to upgrade to an Unlimited Plan, you can visit the store. If you have a Speedify Unlimited account, you can still see how much Speedify data you have used by looking at the Account section in the center of the Dashboard; however, there is no usage meter. 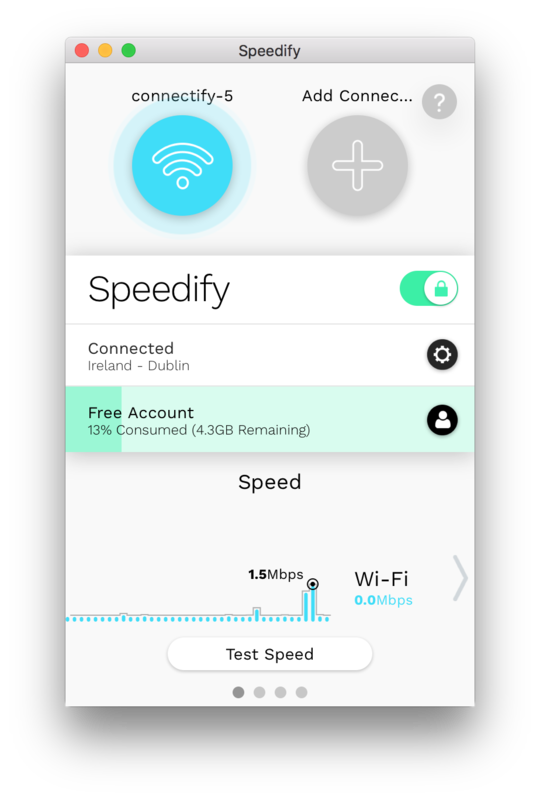 Note that Speedify measures the data sent on all your connections while you are connected to a Speed Server. Thus, there is little relationship between this number and the data cap with your carrier. If you're interested in how much data you've used on each connection (such as Wi-Fi v.s. Cellular), you can click on the appropriate Connection Bubble at the top of the Dashboard. You can also view this information on Monthly | Daily pane by scrolling to the right or clicking on the right arrow in the lower third of the screen. How do I get a Speedify account? Where can I download the latest version of Speedify?